The Japan-UK Joint Symposium on Coordination Chemistry is now in its third iteration and highlights the networks and partnerships between the two countries. The meeting, which is supported by Royal Society of Chemistry Dalton Division, Coordination Chemistry interest group, invited 20 excellent coordination chemists from each country to deliver lectures on their recent advances in coordination chemistry, in one of five themes: supramolecular chemistry; materials chemistry; energy and environmental science; organometallic chemistry/catalysis; and bio-coordination chemistry. This year the meeting took place at the University of St Andrews between on 30 April-2 May 2018. The event was attended by a little under a hundred people and 17 posters were presented. 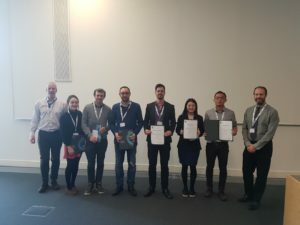 Qingshu Zheng from University of Edinburgh was awarded the Chemical Science award for their poster titled: How important are metallophilic interactions? Ellie Tanaka from University of Edinburgh was awarded the Chemical Science award for their poster titled: Copper iodide complexes for hole transport in solid-state mesoscopic solar cells. Diego Rota Matir from University of St Andrews was awarded the ChemComm award for their poster titled: Homochiral emissive supramolecular [Ir₈Pd₄]16+ cages. Hannah Potter from University of St Andrews was awarded the Dalton Transaction award for their poster titled: Design, synthesis and characterisation of Pt(II)-metalloligands used for thermal and photochemical self-assembly. Cei Provis-Evans from University of Bath was awarded the Catalysis Science & Technology award for their poster titled: Ironing out the competition: iron catalysed alkyne trimerisation at room temperature. 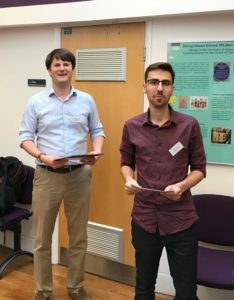 Michael Shipman from University of Glasgow was awarded the Catalysis Science & Technology award for their poster titled: A re-evaluation of Sn(II) phthalocyanine as a catalyst for the electrosynthesis of ammonia. From left to right: Co-organiser Professor Neil Robertson (University of Edinburgh) with winners Hannah Potter, Diego Rota Matir, Cei Provis-Evans, Michael Shipman, Ellie Tanaka, Qingshu Zheng, along with Dr Jeremy Allen (Royal Society of Chemistry). 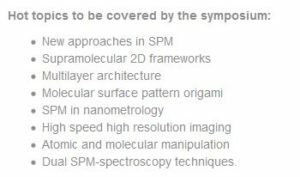 We are proud to reveal that ChemComm will be sponsoring the 4th International Conference on Scanning Probe Microscopy on Soft and Polymeric Materials (SPMonSPM). 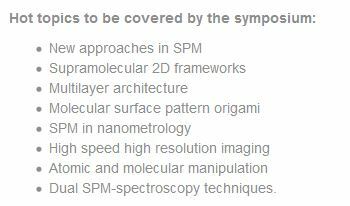 This symposium will be held on the 20 – 24 August in Leuven (Belgium) and will cover research on SPM applied to soft matter, polymeric materials and biological systems. The conference will include a short course, plenary lectures, a range of talks and dedicated poster sessions on topics across this field. Registration is currently open and the early bird registration deadline is the 1st May! ChemComm is pleased to announce a themed collection in conjunction with the upcoming symposium on Scanning probe frontiers in molecular 2D-architecture world. This collection is being Guest Edited by Professors Xavier Bouju, Frederic Cherioux, Steven De Feyter and Alain Rochefort, co-organisers of the symposium. Both the conference and themed issue will focus on scanning probe microscopy, both experimental and theoretical work, which we hope will encourage and promote the research in this area. For more details on the conference and the full programme follow this link. Researchers wishing to contribute to the ChemComm collection should contact the Editorial Office in the first instance. We are proud to announce that Dr. Rafal Klajn, at the Weizmann Institute of Science in Israel, as the recipient of this year’s Cram Lehn Pedersen Prize in Supramolecular Chemistry! This prize, sponsored by ChemComm, is named in honour of the winners of the 1987 Nobel Prize in Chemistry and recognises significant original and independent work in supramolecular chemistry. Our warmest congratulations to Rafal, a well-deserved winner! Rafal is an Associate Professor at the Weizmann Institute of Science and will receive the award during the 2018 International Symposium on Macrocyclic and Supramolecular Chemistry (ISMSC). This annual conference consists of sessions of invited lectures that focus upon a single topic area, award lectures and poster sessions. 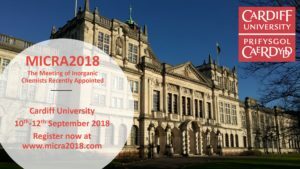 This year, the conference will also feature evening sessions on supramolecular chemistry with keynote speakers as well as an exciting series of Nobel Lectures on the final day! Previous winners include Tom F. A. de Greef, Ivan Aprahamian, Feihe Huang, Oren Schermann, Tomoki Ogoshi, Jonathan Nitschke, and Amar Flood. Those who are within 10 years of receiving their PhD on 31st December 2017 are eligible for the 2018 award. The winner will receive a prize of £2000 and free registration for the ISMSC meeting in Québec, Canada. 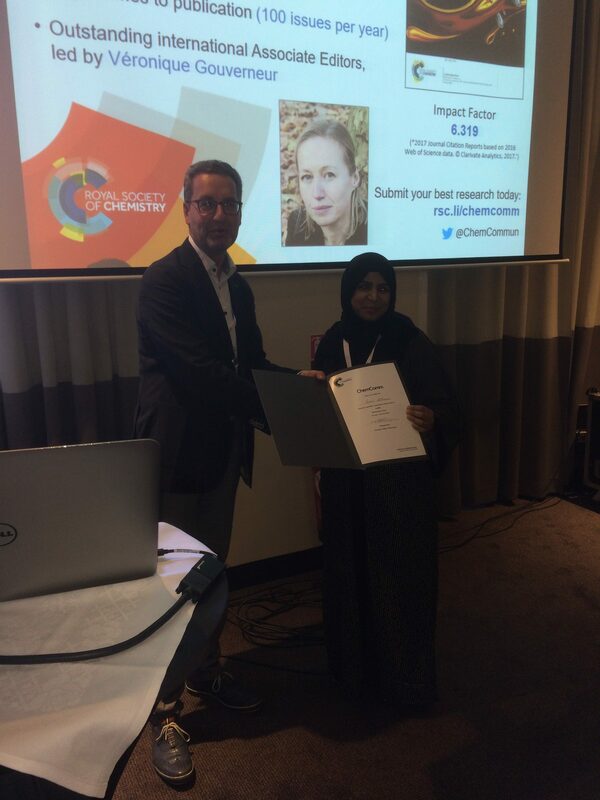 In addition to giving a lecture at ISMSC, a short lecture tour will be organised after the meeting in consultation with the Editor of Chemical Communications, the sponsor of the award. You may nominate yourself or someone else. Please send your CV, list of publications (divided into publications from your PhD and post-doc, and those from your independent work), and if desired, a letter of support, or these materials for someone you wish to nominate, to Prof. Roger Harrison (ISMSC Secretary) at rgharris@chem.byu.edu by 31st December 2017. The 2nd From Carbon-Rich Molecules to Carbon-Based Materials Conference is to be held 7th – 10th June in Nassau, Bahamas. This interdisciplinary conference will provide unique “fusion” opportunities for chemists, physicists and engineers having various backgrounds but sharing passion and interests in carbon-only or carbon-rich molecules and carbon-based materials. It will allow a diverse group of scientists from all over the globe to discuss the current challenges, needs and prospects of this quickly-evolving multidisciplinary field. 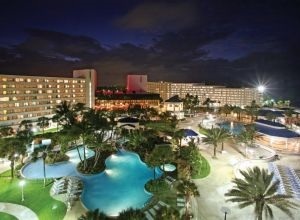 You can click here to register now and see here for further information about the conference. ChemComm is pleased to announce Dr.ir. 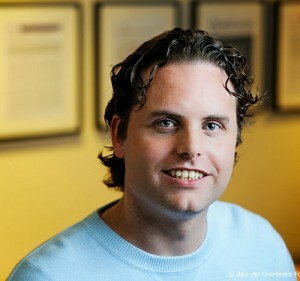 Tom de Greef, of the Biomedical Engineering department of Technische Universiteit Eindhoven, as the recipient of this year’s Cram Lehn Pedersen award in Supramolecular Chemistry, a prestigious prize awarded annually by the ISMSC International Committee to young researchers. Our warm congratulations to Tom! The prize, sponsored by ChemComm and named in honour of the winners of the 1987 Nobel Prize in Chemistry, recognises significant, original and independent work in supramolecular chemistry by emerging investigators. Scientists who gained their PhD less than ten years previous are eligible for the prize. Tom is an associate professor at the Eindhoven University of Technology and FMS member, and will receive the award during the 2017 International Symposium on Macrocyclic and Supramolecular Chemistry (ISMSC) which will take place in Cambridge (U.K.). We are also delighted to announce that the 2017 International Symposium on Macrocyclic and Supramolecular Chemistry (ISMSC) will be held in conjuction with ISACS: Challenges in Organic Materials & Supramolecular Chemistry. Full details of all the confirmed speakers may be found on the event website. We hope you can join us in Cambridge, UK – save the dates 2–6 July 2017! Tom will also be speaking at the first biannual International Conference on Molecular Systems Engineering (ICMSE) in Basel 27 to 29 August 2017, in Basel, Switzerland. ICMSE is a unique event in the emerging field of molecular systems engineering, and has the potential of leading to a long-term paradigm shift in molecular sciences. The three-day conference will be held at the University of Basel (Kollegienhaus, Petersplatz 1). Download the conference flyer (pdf) for more details and book your place now!